Ricki’s Cookie Corner was started by Ricki Krupp in 1980 in her kitchen in Memphis, TN. It was there that Ricki began baking her homemade blend of soft chewy chipsticks and delicious Challah Bread to the delight of Memphians and their gift recipients nationwide. Before long, the word was spreading faster than the ovens could produce. In 2000, Ricki opened a retail location to meet the demand of customers. Ricki has built quite the loyal fan base over the years. The business is built around “word-of-mouth” marketing; Ricki lets her products speak for themselves. Some of her customers have been with her for over 25 years. Once you try something from Ricki’s Cookie Corner, it’s hard to settle for anything else. As her business grew, corporate customers began calling her to provide delectable and memorable gifts for their clients. Ricki gladly obliged and has expanded her business into a corporate gift-giving center, providing unique corporate gifts year-round. 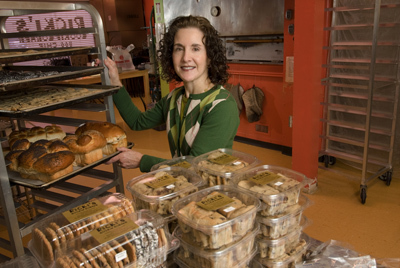 In 2008, Ricki's daughter, Aviva, joined the business and helps oversee in-store operations as well as manages the bakery's e-commerce business. Today, Ricki’s treats are enjoyed by customers all over the country. Whether you are saying thank you to clients and customer, looking for the perfect gift for friends or family or for a scrumptious treat for yourself Ricki’s Cookie Corner is the delicious choice. Even though the business has expanded well beyond her kitchen at home, Ricki continues to add her personal touch to every item that is baked. Ricki is all about making her customers happy. If you call the store, Ricki will most likely answer the phone. To be a customer of Ricki, is to be her friend too.